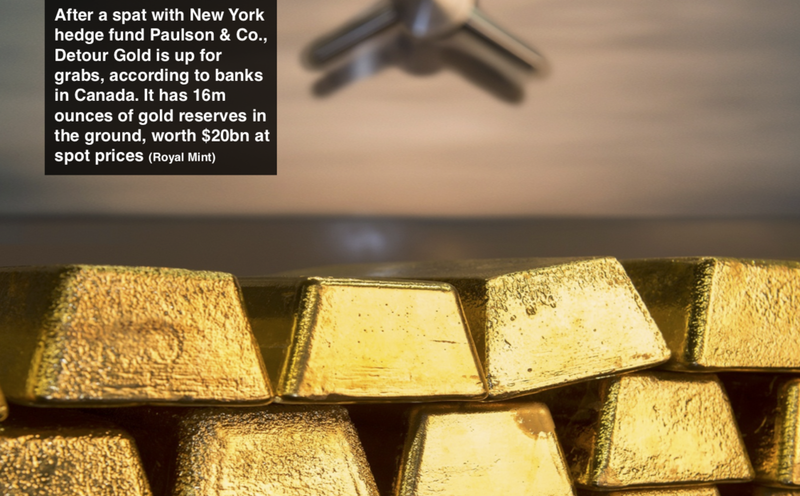 It owns one of the world's largest gold mines and has a C$2.3bn ($1.8bn) market cap, but directors at Detour Gold are fighting for their posts having been drawn into a spat with Paulson & Co., the hedge fund led by investor John Paulson. Paulson & Co. has called for Detour to be sold or overhauled, accusing gold groups of “chronic, poor M&A”, digging the sector into a hole of “irrelevance and oblivion.” But Detour said it wants to avoid an “ill-timed fire sale,” accusing Paulson of running a “self-serving agitation campaign” in a “desperate attempt to resuscitate its flailing reputation”. M&A advisers saw dollar signs, linking Detour to at least six would-be acquirers. “Blood in the water?” asked Scotiabank. “Who Could Devour Detour?” wrote CIBC in a note to clients. Barrick Gold looks most in need of an acquisition, reporting negative quarterly cash flow this week of $172m. Bumpy production in Nevada, an earthquake in Papua New Guinea and a rock fall in Australia brought in production well short of full-year guidance of up to 5m ounces and Barrick's shares have nearly halved in the last two years. “Yes, our reserves are going down. Yes, it’s something we have to deal with,” CFO Catherine Raw told The Globe & Mail. Detour would add 600,000 gold ounces to Barrick's annual production, but it may also try to revive talks with its neighbour in Nevada, Newmont, which announced a $275m deal to buy into the Galore Creek gold deposit in British Columbia earlier today. Co-owned by copper group Teck, the 8m-ounce deposit would be the tenth project Newmont has built in the last five years, putting it on course to overtake Barrick as the world's biggest producer. Detour Gold has engaged Wes Hall, one of Toronto's sharpest corporate advisers, who has previously worked closely with Yamana Gold's steely CEO Peter Marrone. Corporate battles are not like “a pillow fight,” Hall has said. When diamond giant De Beers pulled out of an exploration agreement on Baffin Island in Canada in 2013, its partner dropped quickly: shares in Peregrine Diamonds fell from 65 to 30 cents. Five years on and De Beers looks more like the falcon. Advised by investment bank BMO it has swooped to pick up the pieces, making a C$107m ($81m) takeover offer for Peregrine and its key Chidliak project, equal to 24 cents per share. Mining is enjoying “a gentlemanly boom”, say analysts at Investec: boards are being cautious, ambitions muted, as the market “wavers” between the prospect of robust growth and a US-led trade war. All that is very different to the last up-cycle when companies raced to buy and build new mines, prompting $273bn of write-offs when prices tanked, according to new figures by JPMorgan. But one board that is not being excessively polite is Lundin Mining: chairman Lukas Lundin, the Swedish billionaire, is trying to barge through a takeover of Nevsun Resources, hoping to pocket its Timok copper deposit in Serbia.